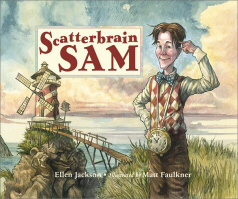 The author of more than fifty books and a multiple award-winner, children's writer Ellen Jackson is not afraid to explore different formats -- she has penned picture books, science trade hardbacks, and a 12-volume series called It Happens in the Month of... Jackson calls writing for children "the best job in the world. I get to go to work in my pajamas, write for a few hours, then spend time with my dog and husband, who also works at home (the husband, not the dog)." Jackson has been shortlisted on the John Burroughs List of Outstanding Nature Books for Young Readers, the Read America! Collection Choice, and Instructor Magazine's 71 Top Books of the Century (nonfiction). 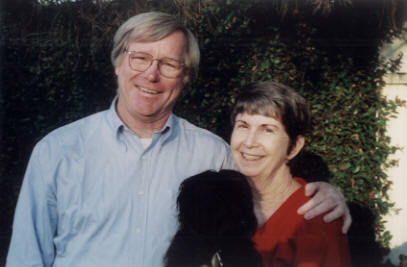 Her books have been featured on PBS, CSPAN2, and the Today show. Cinder Edna, Jackson's hilarious take on the Cinderella story, is now part of the recommended reading list for Mentoring USA. Tell us something about your upcoming book, Earth Mother. What inspired it? I was working on another picture book manuscript about animal behavior. In doing the research, I learned that sea otters often sleep in a kelp forest, anchoring themselves to the seaweed to keep from drifting away. An image of an otter being rocked on a bed of seaweed by an Earth goddess kept popping into my head. So I did what I often do when I have a fragment of an idea -- I began asking questions. Who is this goddess? Is she a caretaker of some kind? Who else does she protect? And gradually the story began to take shape in my mind. I’m very excited about this book. It’s received three starred reviews and was illustrated by Leo and Diane Dillon, two of my favorite artists. I’ve admired the Dillons for years but never dreamed I’d have a chance to work with them. How did you begin writing books for kids? I loved to write when I was a child, but my mother discouraged me from becoming a writer. She wanted me to train for something practical -- so I became a teacher. I read books to my class every day, and I kept thinking, "I could do that." Eventually I moved to a town where jobs were scarce. No problem -- I decided (sorry Mom!) I’d just make my living as a writer. I wrote a picture book that I thought was a work of genius (it wasn’t). I worked and worked on the manuscript and probably rewrote it fifty times. While working on book number one, another idea occurred to me. I wrote book number two in about fifteen minutes, and sent the first draft off to five different publishers. I also submitted it to a writing class, where the teacher tore it apart in front of everyone. I totally lost interest after that, but one of the publishers actually bought it. That manuscript, The Grumpus Under The Rug, is still in print and has done very well. Did you have an agent in the beginning or did you send the manuscript out yourself? Over the years, I’ve worked with two agents. But I’ve also sold books on my own. I don’t have an agent right now. It’s my belief that children’s writers who study the market and learn about publishing don’t really need an agent. I prefer to work without one these days. My ideas are by-products of my life, my childhood, the books I’ve read, my hopes and fantasies -- everything that’s gone into making me who I am. I’ve noticed that ideas come more readily to people who pay attention. After I published my first book, I was afraid I’d never have another idea again. But I kept writing, and the ideas kept coming. I keep an idea file, and when I get an idea I write it down on a card. I always check Amazon or BOOKS IN PRINT to seem if anyone else has published something similar -- and if so, how long ago that was and in what format. If my idea has already been done in the same way and in the same format, I usually pass. I always picture a parent walking into a bookstore and looking for the perfect book. I want to come up with something so compelling that any parent would be willing to pay $18.00 (the price of an average picture book) for the book that I write. Have your personal background and experiences played a significant role in what you write? I think that children’s writers need to remember what it is like to be a child –- the smells, the tastes, as well as the fears and the misunderstandings that kids have about the adult world. Some of my best ideas come from my memories of how children think. For example, I recently sold a manuscript based on my childhood take of geographical names. As a child, I thought that Death Valley was full of skeletons and that Orange County was inhabited by lots of orange people. I took the core of this idea and expanded it into a picture book. What do you consider your biggest writing success? My books have won many awards, but the most satisfying part of being a writer is to get a heartfelt letter from a child. Sometimes I get letters that were "assigned" by a teacher, and these are not the letters I most enjoy -- although I try to answer every letter I get. But when I get a letter from a child who honestly enjoyed one of my books -- there’s no better feeling. To me that’s success, and it’s worth more than all the awards and recognition from adults. I have to add, though, it’s also been personally satisfying that I’ve managed to make a living as a writer. But my guess is that’s not what you mean by "success." Financially speaking, several of my books have been quite successful. Cinder Edna is probably my most popular book. It continues to do well year after year. It’s been made into a video and optioned for television. Next year it will be performed as a musical by Stages Theatre in Minnesota. You write in a variety of genres. Is this an individual choice or do you think children's writers in general tend to explore more than one genre? I’m not sure I can speak for other writers, but I enjoy working in different genres. Houghton Mifflin has a marvelous series, SCIENTISTS IN THE FIELD. Writers for this series get to travel to exotic places to observe scientists working "in the field." 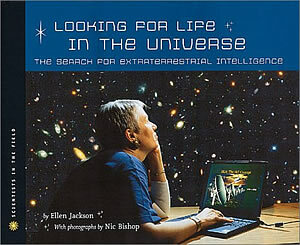 I’ve been lucky enough to have written two books in the series –- Looking for Life in the Universe, a book that features Jill Tarter and her work with SETI (a group of astronomers that use radio telescopes to search for signals coming from extraterrestrial civilizations), and, more recently, The Space Scientists: Supernovas, Black Holes, and Dark Energy. This book (to be published in 2007) will feature the work of Alex Filippenko, an astronomer who searches for supernovas using the Keck telescope in Hawaii. For that project, Nic Bishop (the photographer) and I went to Hawaii and watched Dr. Filippenko work. I know, I know -- it’s a tough assignment, but someone had to do it. You have an incredible number of books published. Tell us a little bit about them and how you manage to be so productive. I’m basically a generalist. I have a wide range of interests, but not enough of an interest in any one topic to devote my entire life to it. So I like to write short books -- picture books and nonfiction for young children. The nonfiction allows me to read about a subject I’m interested in for a few months, write the book, and then move on to something else. I also love stories, and that’s why I write fiction. I think people get hung up on the word "book." Most of my books are shorter than an average magazine article, and that allows me to be productive. My track record is good, but not extraordinary. Jane Yolen, for example, has published more than 200 children’s books. Do you have a set schedule for writing? What is your average day like? There are no average days. All the books I’ve already published or written need managing, so my writing day is pretty chaotic -- broken up by phone calls from editors, emails, requests for rewrites, trips to the library, trips to the post office, correspondence from other writers, the need to check royalty statements, mass mailings to promote a new book, etc. etc. I try to squeeze in writing time whenever I can. Do you work on more than one project at a time? If yes, how do you manage? Yes. I like working on more than one project at a time. If I get stuck on one, I can always move to another. Right now, I have a book deadline and that’s a little different. I have to give that one project my full attention. I’ve never missed a deadline and I don’t want to start now. Are there common mistakes you see new writers making? What suggestions would you give them? Yes. First, many people don’t bother to learn the basics before they start submitting manuscripts. Writing for children is a profession and there’s a lot to learn. People need to get the current year’s Children’s Writer’s & Illustrator’s Market and study it. They should also read a couple of good books about the children’s publishing industry, such as The Complete Guide to Publishing Children’s Books by Harold Underdown and Lynn Rominger. Also, they need to read lots of books in the genre they hope to write for. It’s important to see what’s already been done, so they don’t submit a manuscript based on an idea that’s been done a thousand times before. Second, some new writers get so hung up on their story that they forget to polish their language. How someone tells a story is as important as what story it is that they’re telling. Writers should make sure that the language they use is fresh, entertaining, and compelling. What other books are forthcoming? Aside from The Space Scientists, which I’ve already described, I also have a book entitled The Worlds Around Us coming out (I believe) in 2006. That book uses the most recent research on the planets and moons of the solar system to describe a boy’s fictitious journey to each of them. The illustrations will be really unique. For the background, Ron Miller (the illustrator) is using his incredible paintings of each planet and moon and the foreground figure of the boy and his spaceship will be drawn in. Cinnamon Brown and the Seven Dwarfs, a fractured fairy tale, will also be released in 06. 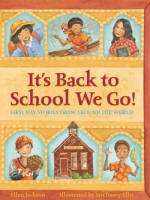 That one will be illustrated by Elbrite Brown, who won the Coretta Scott King and John Steptoe awards in 2004. I’m really excited about that one too. I’m working on a historical biography and a couple of science books. I have some stories that need to be rewritten. One is a retelling of a myth and one is an animal story. Anything else you'd like to tell Vision's readers? Yes: don’t underestimate the power of persistence. The people who make it as writers are the ones who don’t give up, the ones who don’t let rejection get them down -- not the most talented or gifted.